I’ve made it no secret that I’m not a “pro” coffee guy. I’ve had a long time love affair with coffee but I’ve never truly geeeked out on it until recently. For a number of years I’ve had a very cheap electric blade grinder similar to this one but not exactly that I’ve used on my coffee beans from time to time. In the past I never really bought good beans either – just picked up bags of supermarket brand beans from time to time if I saw a good sale and was in the mood to grind myself. Honestly though, until I started this blog back in early 2014 I had only used that blade grinder once in the past year when my dad came to town with a bag of beans in hand. Over the first month of me running this blog I instead relied upon my local coffee roaster Quackenbush Coffee Roasters and my local supermarket to grind my beans for me. Needless to say I am now in the market for a good conical burr coffee grinder to get the job done myself in the kitchen and I’m now looking into the benefits and disadvantages of getting a manual grinder as opposed to an electric. Let me summarize my thoughts. If you really want to complete your coffee brewing arsenal, you need to own a good coffee grinder. Why? Ensure that you always have fresh brewed coffee. You will only grind coffee beans when you need them. And even if you do it every morning, or when you feel like drinking coffee, it will only take you a minute or two to grind coffee beans good for 2 cups of coffee. It is a little effort but the result is a beautifully tasting cup of coffee. Control the type of grind you want. Maybe you have a French press and an automatic drip coffee machine at home. Either way, you will need different types of coffee grounds to achieve the optimum cup of coffee. If you own a coffee grinder, you can adjust the texture of the ground coffee according to your preference. This is considered the cheapest kind of grinder. Your kitchen blender can double as a crude blade coffee grinder. Just like the blade of a blender, this type of coffee grinder slice, tear and smash coffee beans. However, it makes inconsistent grinding. Plus, the high RPM rate can burn the ground coffee. According to experts, if you are using a blade grinder, grind the beans for 20 seconds tops. 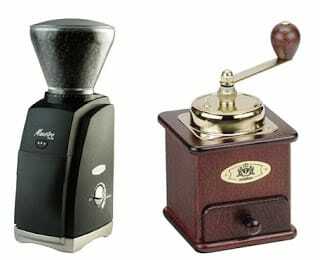 Nothing beats old-fashioned, manual, hand-driven, burr grinders. It may sound so old school but the rhythmic fashion of hand grinding produce a consistent texture of the ground coffee. You will need a minute to grind coffee beans for a cup of coffee. You may need to put in a lot more effort for your freshly ground beans, but it’s worth the investment in time and energy. How much effort will I likely invest on my coffee brewing activity? Do I need to make a quick cup? Or, can I have some leisure time in the morning or in the afternoon to make great cup of coffee? What is my budget? Am I willing to spend a little bit more if the grinder I chose is higher than my estimated budget? What kind of brewing method will I use on a regular basis? Will I use French press every day? Or will I stick with the moka pot? The answer to these questions will help you weigh the features of an electric grinder and a manual grinder. You are now ready to decide which one you will get to achieve the kind of brew you want for your morning cup of coffee. Manual grinders are nostaligic and can look pretty decorative in the kitchen. Manual grinders do not heat beans during the grinding processes which can have a minimal negative impact on flavor. Manual burr coffee grinders are notable cheaper than their electric peers. Manual coffee grinders tend to be easier to clean than electric models. A manual coffee grinder can be expected to last longer than an electric model – they tend to be more durable. Manual grinders encourage you to grind only what you need in the moment instead of grinding a bunch of beans ahead of time. Manual coffee grinders are much more quiet than even the quietest electric burr grinders. Electric burr coffee grinders are much faster to grind. It takes a lot longer time and more effort to fully clean out an electric grinder. Looking at the list above I think it’s clear I added a manual burr coffee grinder to my collection of coffee equipment. I know hand crank models take a lot longer to work but I like simple pieces of equipment that are durable and effective. Because both manual and electric grinders basically work the same way the quality of the grind is usually consistent between the two. You aren’t really giving up quality of grind by opting for one grinder over the other. Electric burr grinders are fast and pain-free. Pain-free because you will not use your hand and wrist to grind the beans. People with hand injuries will love the electric burr grinder. You are willing to spend at least a couple of hundred bucks. Electric grinders are synonymous with convenience. They are easy to assemble and use. You can have ground coffee with just a push of the button, in less than 20 seconds. But be ready to shell out some cash. There are cheap electric burr models but as they say, you get what you paid for. Manual powered grinders are a labor of love. You need to put a little bit of effort to get your coffee grounds but you will be rewarded for your perseverance. This style works well with pour over machines and French press coffee makers. Even if you have money to burn, getting a manual grinder will still work best. It gives an even and consistent grind because you can control the strength and pressure of every twist and turn. Plus, you can take the manual grinder anywhere. This is perfect for outdoor activities like barbecues, parties, and camping. See this post for information on getting a plumbed coffee maker. The one major thing to look in hand powered models seems to be the stability of the conical burrs. Meaning, you don’t want to get a cheap grinder where the burrs can slip resulting in grind size irregularities. You want a solid spring or thread to hold the ceramic (or steel) burrs in place securely. So far I’m mostly looking a lot at the Hario mini hand-crank grinder based on product size, cost, and reviews and the Melitta Electric Burr Coffee Grinder (mostly due to it’s low price and positive reviews) in case I decide to just go for the grinder that doesn’t require manual labor. In the next few days I’ll be crafting a page outlining many of the better hand-held burr grinders and probably electric too and then I’ll be taking a more in depth look at the one I ultimately choose for my kitchen.